Relief from catarrh, colds and blocked sinuses. Contains pure plant oils.The pure plant remedy for symptomatic relief of blocked sinuses, catarrh, hay fever, colds and flu. Olbas Inhaler contains essential oils that have decongestant properties. Before you use Olbas Inhaler. Do not use if you are allergic to any of the ingredients. Taking other medicines. Please tell your doctor or pharmacist if you are taking or have recently taken any other medicines, including medicines obtained without a prescription. Pregnancy and breast-feeding. It is best not to take any non-essential medication when pregnant or breast-feeding. Ask your doctor or pharmacist for advice before taking any medicine. 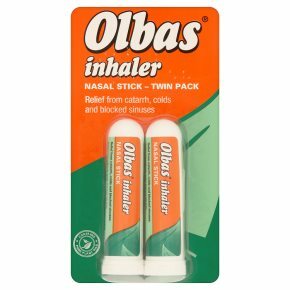 How to use Olbas Inhaler Adults and children aged 6 and over: Unscrew outer cover from base of stick, close one nostril, place inhaler in other nostril, and inhale deeply. After use, wipe stick with a tissue and replace cover. Not recommended for children under 6 years old. Do not use more than 4 times an hour. If you use more Olbas Inhaler than you should, talk to a doctor or pharmacist. You must contact a doctor if symptoms worsen or do not improve after 7 days. Possible side effects Like all medicines, Olbas Inhaler can cause side effects although not everybody gets them. May cause allergic reactions such as rash. If you notice any side effect, please tell your doctor or pharmacist. Keep out of the reach and sight of children. Do not use Olbas Inhaler after the expiry date which is stated on the packaging.